Over the last several years it’s become a critical commonplace that SFF is glutted with trilogies, series, sequels. Where, cry critics (myself included), are the standalone novels of yester year? Have we forgotten, we lament, how to tell a story in a single book? Reflecting on last year’s reading, though, I was blown away by how many of my favourite novels were not only sequels, but the much-maligned Middle Book of a Trilogy. According to the received wisdom I’ve absolutely been guilty of indulging in from time to time, such books tend to be slower, considered filler, at best building effective scaffolding for a finale. So in this month’s column I want to dig deeper into the strange work of sequels by looking at why and how these books dazzled and surprised me. Mishell Baker’s Borderline was one of the most remarkable books I read last year (and is, as of this writing, nominated for the Nebula Award). It’s justly lauded for centering its story on Millie Roper, a disabled bisexual woman with Borderline Personality Disorder, without letting any of those elements overshadow either her character or the plot. In a world where discussions of mental illness and disability are usually the province of saccharine after-school specials (though I confess I have no idea if those are still a thing – will they go the way of televisions tuned to dead channels? ), Borderline is intensely refreshing. That said, the last thing I want is to celebrate its success at representation to the exclusion of its sharp, dextrous prose style, sly character work, and courage in plumbing the depths of people’s interactions. When I think of Borderline, I don’t immediately think of Millie’s attributes; I think of the quality of the writing, of its sensory affect. Baker’s prose is a liquid line with light in it, that you can’t tell is gasoline until she touches it with a match. Now, Borderline is urban fantasy, of which long, multi-volume series are staples; it’s typical for a series such as, for instance, Kim Harrison’s Hallows, to begin each new book with an awkward expository section to catch you up on the state of things, like the “previously” bits on TV. But Borderline’s sequel, Phantom Pains, makes striking virtue of that necessity: the plot, in a world where fairies exist but ghosts don’t, is that people are being literally haunted by the events of the previous book. 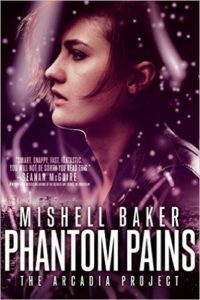 Ironically, this means that Phantom Pains is functionally a standalone novel; the flashes to Borderline are so thoroughly woven into the plot structure that they hardly seem to refer to a story outside it. Meanwhile, the fairy politics are being so up-heaved that the audience may as well be starting from scratch, while Millie’s first-person narration provides the continuity necessary to returning readers. Having established structural room to manoeuvre between the premise of her series and the concerns of the present book, Baker does more of everything I loved about Borderline: more difficult conversations, more harrowing revelations, more moments of agonizing, vulnerable intimacy. She also smoothes out the pacing wrinkles of the debut—and is funnier. The late addition of a new character kicks the humour up several notches, and the book dances a tightrope between gutpunch and guffaw. Phantom Pains succeeds in being both seamlessly connected to Borderline and utterly its own ambitious project. I was constantly aware of being impressed with it while being absorbed by it—and I ended up loving it more than Borderline, which is saying something. After the wreck and ruin The Fifth Season made of our feelings, it’s understandable that some readers found The Obelisk Gate a more muted experience. There isn’t a grand, reality-realigning revelation built from the book’s narration strategy, for one thing; Essun stands still instead of travelling all over the continent, for another; and it introduces a number of new characters who perhaps suffer in comparison to the sustained attention given to Essun and her fellow-travellers in the first book. Nevertheless, I’m firmly on the side of it being magnificent in its own right, and completely as engrossing—if not as striking—as its predecessor. I love when space is an organizing principle of a trilogy: something like Edward Carey’s Heap House, Foulsham, and Lungdon, which follow two characters’ adventures in a single house, then a borough, then a city, the story expanding to fill each locale. Jemisin’s Fifth Season starts on the surface of a troubled continent, then delves below it in The Obelisk Gate—and if the title’s anything to go by, The Stone Sky will turn its gaze moon-ward. But this is an oversimplification of what Jemisin’s doing with her series, because each volume is as uniquely pitted, jagged, and colourful as geode. Both books are textured as much as they’re structured, fleshing out Essun’s world and its history through excerpts from historical figures, legends, politicians’ reported speech. And if the series as a whole is concerned with parenthood, figuring the Moon as the Earth’s lost child, then Essun remaining stationary while her daughter travels around her has further resonance for the series—especially as the final volume looks likely to involve inviting and avoiding enormous collisions. 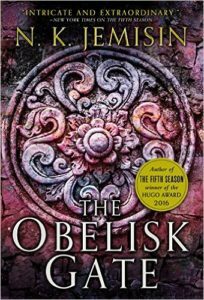 Even when The Obelisk Gate is, in fact, standing still, it’s also lying in wait. In spite of not having read the third book yet, I feel confident in saying that Jemisin’s Broken Earth trilogy should, by rights, be considered a three-volume novel of the old school. It’s epic in the classical sense: a story of how the world came to be and a story of what the world will become. “Let’s start with the end of the world,” says the sly observer narrator of The Fifth Season, moving smoothly from a woman’s heart-broken interiority to the literal breaking of the land’s heart happening around her. From the great to the small, from the inside to the outside, Jemisin’s series investigates the thermodynamics of individuals and societies as well as geology, mapping very carefully the places in which they intersect. I’ve read more stunning sequels recently than I can get into at length in this column, but let me end by saying that Fran Wilde’s Cloudbound, which I covered in my last column, managed the difficult trick of engaging me more fully instead of alienating me by writing it from a different character’s point of view, one better suited to the material of her story; Ken Liu’s Wall of Storms dazzled me by addressing all the complaints I had about women and agency in The Grace of Kings and completely changing his storytelling style; and Nnedi Okorafor’s Binti 2: Home brought into focus the family life Binti left behind in the first book. My early reading of fantasy taught me to expect disappointment from the second and third volumes of trilogies, as if the book that hooked me was just a burst of energy spent too soon in the marathon. The story felt diminished by being extended. These books, though—with their complexity, their invention, their ambition, and attention to structure—are welcome amendments to that narrative. Ultimately, if I were to name one thing these books have in common, it’s an awareness of enterprise—a desire to have the whole be more than the sum of its parts, and an appreciation for how those parts fit together.